Between 1700 and 1800, Amsterdam was depicted numerous times in often very detailed drawings. 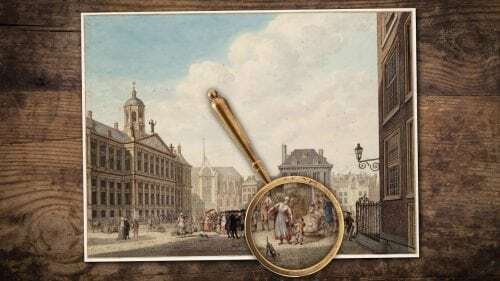 The Amsterdam City Archives is showing the most beautiful of these during Kijk Amsterdam, the very first retrospective of these topographical drawings. The drawings bring the Amsterdam of that time, and the life of Amsterdammers, very close. The images are often in colour, almost two centuries before the advent of colour photography. The city is still clearly recognisable: the drawings show the familiar places on the Dam, along the canals, and along the rivers Amstel and IJ. But they also show gates, narrow streets and places that have changed beyond recognition. The eighteenth century saw an explosive growth of such drawings in colour. Especially in the second half of the century, more artists than ever concentrated on cityscapes, which they drew with the greatest care, and often as miniatures in pencil, ink and watercolour. This growth was due in large part to the increasing hunger for encyclopedic knowledge. It was the time of the Enlightenment. Collectors compiled collections of prints and drawings that increasingly documented Amsterdam in detail.